When we saw the French Heritage tomatoes in early trials a few years back, our first thought was, We've found what we're looking for! For many years while trialing tomatoes we had requests for something that looks and tastes like a cherished heirloom, but with the kind of vigor and productivity that makes growing them well worthwhile. This led to a long list of contenders but no winners until Gautier Semences, a family-owned vegetable breeding company based in the Provence region of France, finally cracked the code! Gautier's new French Heritage tomatoes are the best of the old and new world. Exquisite heirloom flavor and texture combined with practical hybrid disease resistance and yield. "It's no surprise that this marriage took place in Provence, where fresh tomato flavor is held sacred in the local markets," notes Pete Zuck, Johnny's Tomato Product Manager. Available exclusively from Johnny's, these hybrid varieties represent the pinnacle of the traditional breeder's art. We have seen many attempts to capture true heirloom eating quality in a durable plant, and we can say with confidence that French Heritage tomatoes are the best you will find anywhere. The first thing that stood out to us about 'Marbonne,' 'Marnero,' and 'Margold' was how good the flavor was. 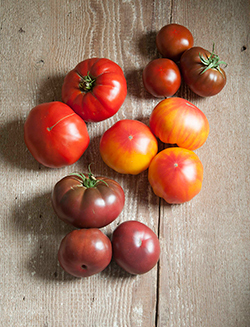 In our opinion they are among the best-tasting tomatoes, with a balance of sweetness and acidity, a complex, layered aroma, and the soft flesh that creates the texture for which heirlooms are famous. Pete calls out another recent Gautier release, in this discussion of taste. "We would be remiss if we did not also mention 'Kakao.' 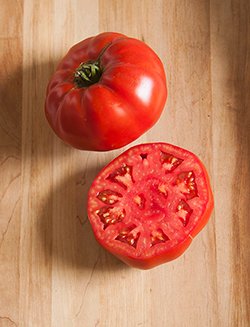 This brown cocktail tomato is similar in appearance to varieties you might find prepackaged in the specialty tomato section of your grocer's produce department, but it surpasses any similar varieties we have trialed with its delightfully complex flavor. Although it does not imitate any particular heirloom the way the French Heritage varieties do, it is every bit as exceptional on the palate." One of the favorite French heirloom tomatoes that is not well known in North America is 'Marmande.' This tomato is revered for its robust flavor and silky texture, but it struggles mightily with disease pressure and other environmental stresses. 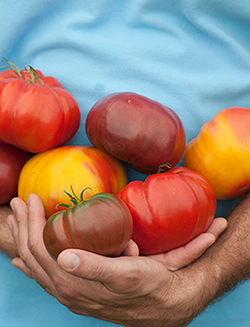 There have been many attempts by European breeders to improve on 'Marmande.' We have trialed a lot of them, and have concluded that 'Marbonne' is the best of the 'Marmande' types. It preserves the look and flavor of this French classic with some notable improvements. 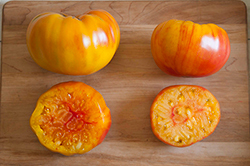 Likewise, 'Margold' and 'Marnero' improve on the archetype of the bicolor and black heirlooms, such as 'Striped German' and 'Cherokee Purple,' respectively, by being more grower-friendly. 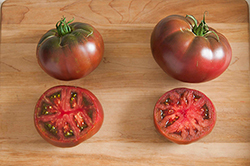 These two varieties are particularly unique, because unlike 'Marbonne,' which has many imitators in the tomato seed market, 'Margold' and 'Marnero' currently stand alone as the only tomatoes available that combine these particular fruit styles with modern genetics. Johnny's is very fortunate to be able to offer these very special varieties. 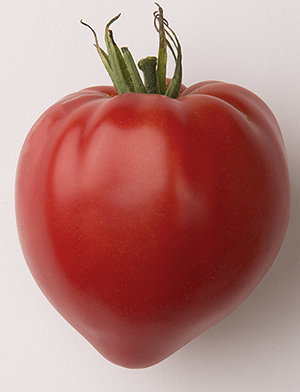 'Cauralina' is the exciting fourth introduction in Johnny’s French Heritage tomato series. We added this cultivar to our 2018 offerings because it matures early, with heavy yields of 8–14-ounce beautiful oxheart fruit and has improved disease resistance over true heirlooms of similar type. Like its French Heritage compagnes, 'Cauralina' possesses excellent eating quality that is uncommon among modern hybrid greenhouse tomatoes. Its heart-shaped red fruit has a meaty texture with no gel, making it perfect for sauce, canning, and salsa; but it also has a full, rich flavor great for fresh eating. Here are additional attributes that make the French Heritage Tomatoes worth growing. What makes the French Heritage Tomatoes grow so well in the greenhouse? One of the most notable improvements of these tomatoes is disease resistance, because disease is one of the challenges that can make heirloom yields so highly variable from year-to-year. 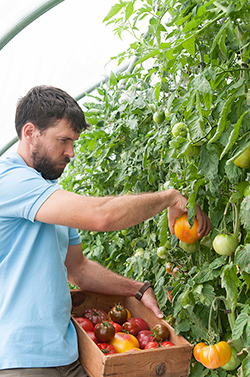 Whether you're growing to sell or for your own use, it can be disappointing to say the least to put the effort into growing heirlooms with an unpredictable return. Each of the French Heritage Tomatoes offers a favorable resistance "package." Other physical characteristics that we thought would appeal to market growers are that the fruits are somewhat smaller, and more regularly shaped than some of the bigger heirlooms. No matter how much people love tomatoes, many customers can have a hard time dropping a five-dollar bill on a single tomato. And for many people today, a smaller-sized tomato is simply more convenient. Finally, stronger, more predictable plant habits combined with disease resistance make these varieties more suitable for greenhouse or hoophouse growing than true heirlooms. Getting these tomatoes in the Johnny's catalog was more complicated than your average variety, though. Gautier was looking for the right partner, and only one partner, to sell these varieties in North America. We would have to demonstrate that Johnny's had the market presence they were looking for to fill that role. As Andrew recounts, "In the fall of 2013, I was attending the Second International Symposium on Organic Greenhouse Horticulture in Avignon, when I was able to meet the breeder at their headquarters, just north of the ancient walled city. We were able to discuss what a good match these varieties would be for Johnny's customers, who need uncompromising flavor and production in order to stay in business." 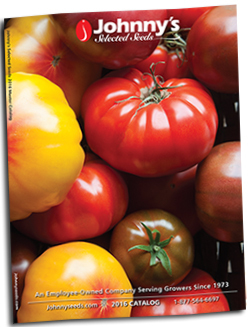 Fortunately, Gautier agreed that Johnny's was the perfect partner to launch this group of tomatoes in the North American market, and they made their debut in our 2015 catalog. Then then graced the cover of one of our 2016 catalogs. And we were right about how popular they would be — selling out in the first year, so we had to order more seed from Europe. We next added a fourth variety, as noted above, the beautiful oxheart 'Cauralina'. The price per seed for these varieties is a little higher, as is typical of European seed. Up front, this can seem like a point of pain. 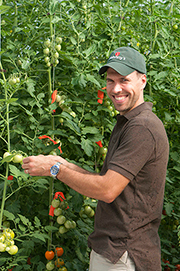 Andrew, who has grown the collection on his market farm in Maine, states, "I figure, if you harvest just one tomato more from one of these French Heritage Tomato plants than from a lower-yielding variety — an expectation you'd be likely to exceed — they will have more than paid for the increased seed cost." We hope you'll try the French Heritage Collection varieties. While the first impression this group makes is one of remarkable taste and quality, they are a great match for growers who want a premium tomato but also want to obtain a good production. We think you'll agree — Ces tomates héritages sont extraordinaire!